Did near-ground turbulence cause the 22 and 46° halos in this spotlight display? Crystal samples should be englightening, but all too often they just make you confused. The observation I made on 22 November 2015 in Rovaniemi is a case on point, although an observation recently published by Alexander Haußmann may now provide a solution. The issue is about the halos from poor crystal orientations – the strongly developed 22 and 46° halos. One explanation for such halos is that they are born from conglomerates of crystals, which, because of their irregular shape, tumble instead of falling stably. 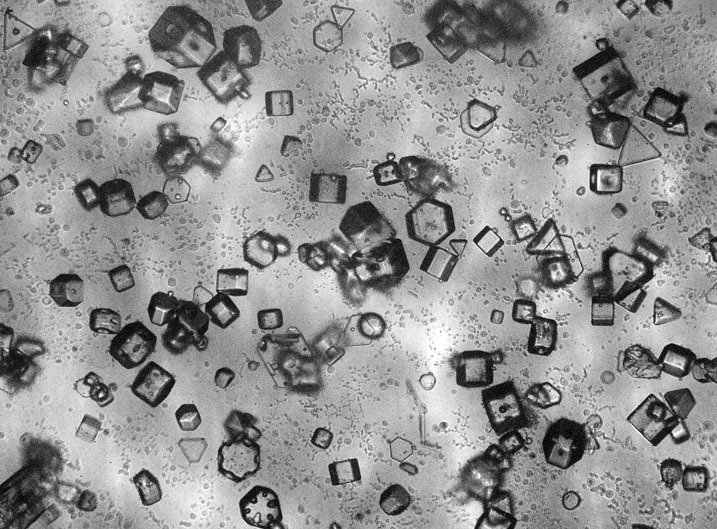 Yet here the crystal sample did not reveal any compound crystals. Sampling bias is pretty much out of question as such crystals, due to their large size, would be expected to fall faster than single crystals and thus should not be able to avoid the collecting dish. Another often-heard explanation is equidimensional crystals. They can’t decide which orientation they want to be in, so they tumble too. Looking at the crystals of this display, such an explanation feels tempting. But then we have other displays where the crystals are pretty equidimensional and yet there is no strong random halo component. Moreover, evidence has been building up that equidimensional (or even slightly plate like) crystals of triangular habit can take Parry orientations. So what’s going on? A diamond dust display photographed by Alexander Haußmann last winter at Mt. Klínovec in the Czech Republic suggests an answer. 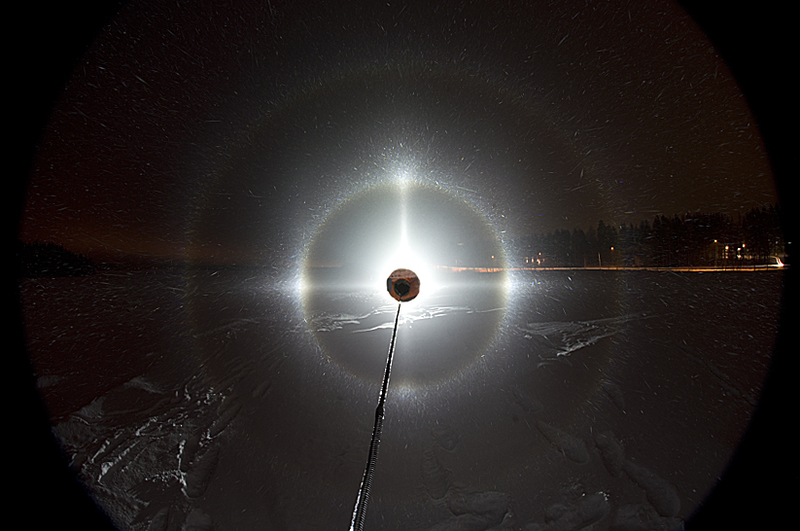 In the beam of car headlight there was visible Moilanen arc, but photographic stacking of the video frames revealed additionally a bit of a circular “Moilanen halo”. No such thing has been known before, which talks of the high stability of the Moilanen arc crystals. That it was seen nevertheless, Haußmann thinks, was due to strong wind, which near the ground became turbulent and instabilized the crystals so much that even Moilanen arc crystals were thrown off-balance. As the wind was exceptionally strong also in Rovaniemi display, it could in a similar manner answer for the strong 22 and 46° halos seen in the photo above. Just like in the Czech display, the light beam was close to the ground, so turbulence had a chance to randomize the crystal orientations. And because the crystals were equidimensional and quite large, that would have served to kick them out of balance with ease.